Swing rhythm never left, but it's getting harder to find someone to teach it! Noted swing rhythm guitarist Ranger Doug of Riders in the Sky takes you step-by-step through the process of expanding your technique on swing rhythm. Whether you play in a swing band, a cowboy quartet like Riders in the Sky, or gypsy jazz, this DVD offers you an absolutely unique and up-close look at chord forms, patterns, right and left hand technique, and insider tips by a swing rhythm master who has been playing this style for over 30 years. In addition, two western classics, "Wah Hoo" and "Tumbling Tumbleweed," are not only broken down and explained in detail, but are performed by 2-time Grammy winners Riders in the Sky in a mini-concert, so that the lesson on those two tunes is exemplified in live performance. 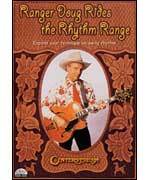 Saddle up, saddle pal, and ride the Rhythm Range with Ranger Doug! Includes transcription booklet.